Jackson Remodeling was recognized with a 2011 REX Award for "best kitchen $125K-$175K" at a ceremony in Newcastle on June 18. 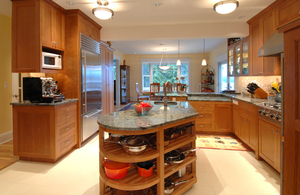 The Madrona kitchen is the handiwork of lead carpenter Willie Johnston, and features design by Michelle Molloy. High tech lighting, "lacewood cabinets", an innovative sliding counter for the espresso machine, and dedicated work and storage areas for the most gourmet of cooks. It's no wonder the Master Builders Association picked this kitchen as "best of the best".